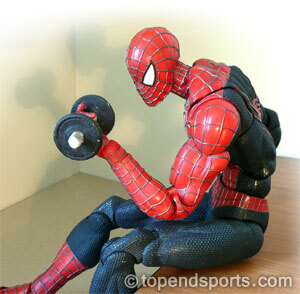 You may have noticed the use of a spiderman figure to illustrate certain exercises on this website, for example on the stretching database. For one, Spider Man is a great superhero, and two, my version comes with over 60 articulated joints which means he can get into almost any position, making him a great example model for exercises on this website. To keep up with the latest in sport science and this website, subscribe to our newsletter. We are also on facebook and twitter.